IMAGINE Crafts and RubberMoon Art Stamps are excited to share with you the amazing projects that our design teams have created to kick off the Holiday Season! Over the next few days, we’ll be sharing with you inspiration and techniques using IMAGINE Crafts’ line of ink products featuring rubber stamps from RubberMoon. Be sure to visit the IMAGINE Crafts and RubberMoon blogs daily for more projects and ideas! I came across a fun technique online recently, on the WPlus9 blog, for creating a Bokeh effect with watercolors. I adapted it to use with the fabulous Memento inks, and now am creating these backgrounds every chance I get! I thought it was the perfect way to showcase these gorgeous Rubber Moon stamps. 1. 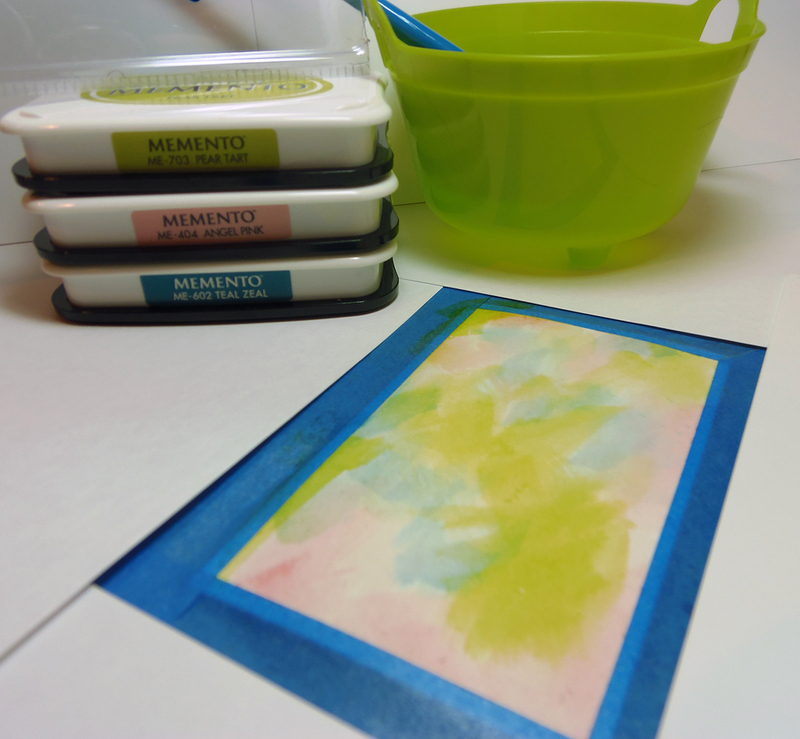 Tape watercolor cardstock down to craft mat using low-tack tape. 2. Brush the entire surface with clean water, to wet it. 3. Create a pool of ink by pressing first color of ink directly down on to spare piece of acrylic packaging or plastic. Pick up ink with wet brush and paint randomly on wet cardstock. 4. Repeat Step Three with remaining colors until entire piece is colored. 5. Dab Stipple Brush #6 directly on to darkest color ink pad and add ink randomly on cardstock. 6. 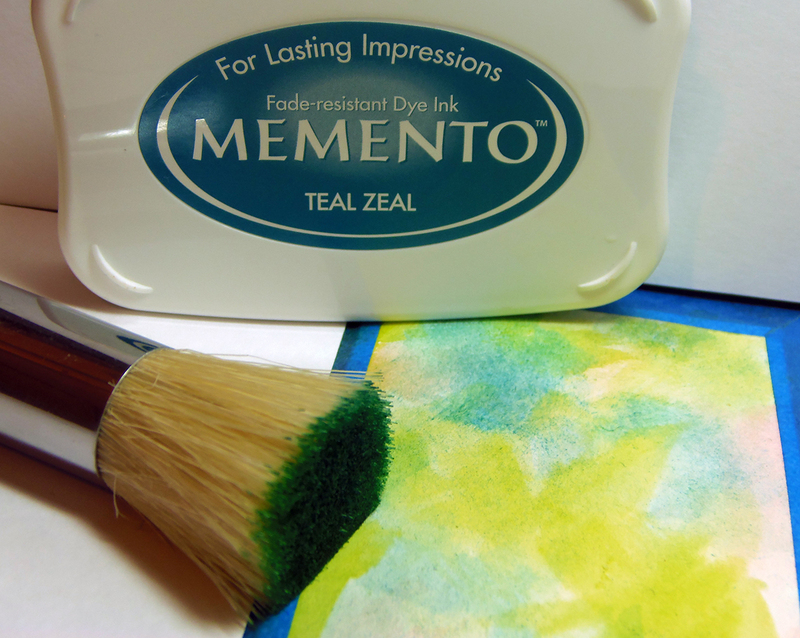 Apply Memento LUXE Wedding Dress ink using a Sponge Dauber. 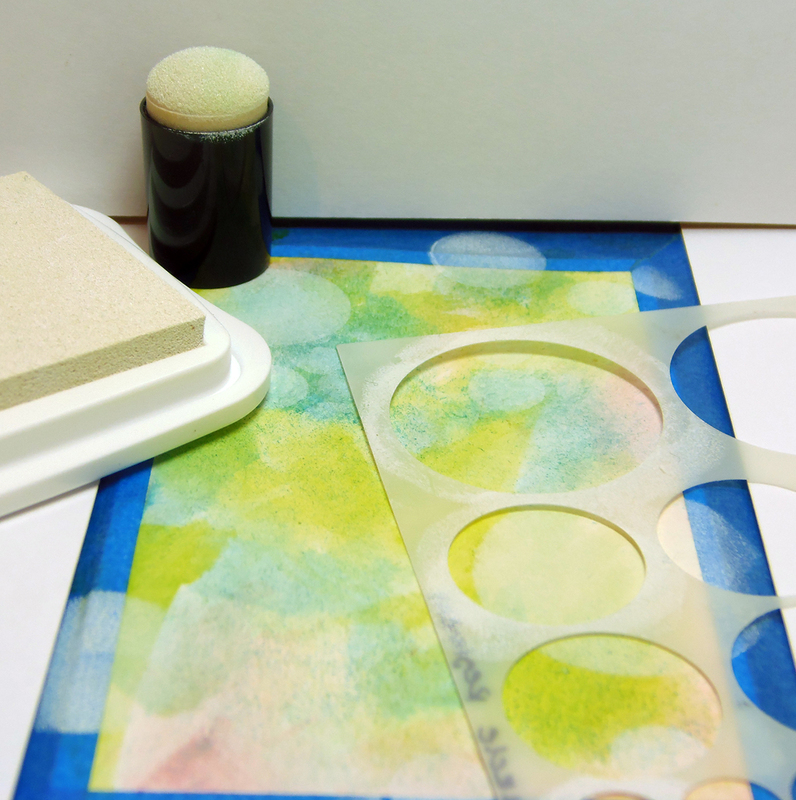 Place the stencil randomly on the cardstock to create one circle at a time. Vary the amount of ink used, so some circles are darker than others. 7. 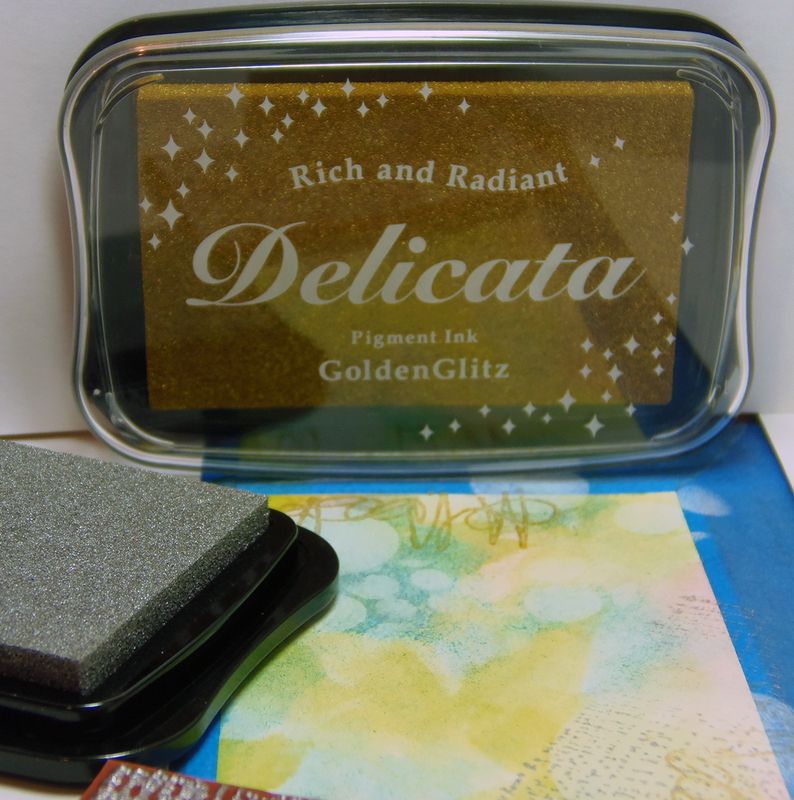 Ink one background stamp with Delicata Silvery Shimmer ink. Stamp one on extra cardstock then stamp directly on to watercolor cardstock. 8. Repeat the process twice with the other stamp and Delicata Golden Glitz ink. 9. Slowly remove low-tack tape. 10. Stamp sentiment using Memento Tuxedo Black ink. 11. Use Wedding Dress Pico Embellisher to create three small dots in the upper right corner. 12. When dry, adhere to card base and add ribbon. 1. Spray kraft tag with Fireworks Summer Sky and allow to dry. 2. Spray tag with irRESISTible Wedding Dress. 3. Blot tag with tissue and allow to dry. 4. Spray tag with Fireworks London Fog. 5. Blot tag with tissue and allow to dry. 6. 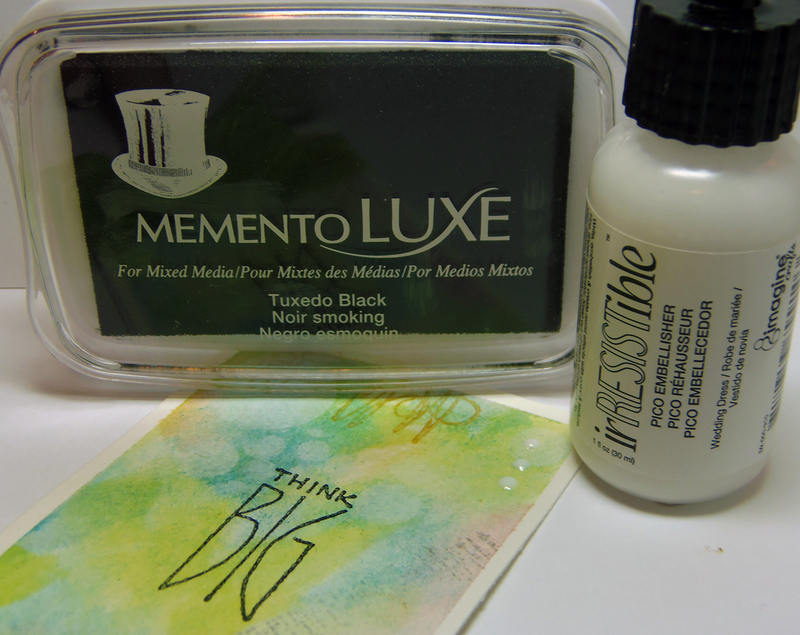 Shade the edges of the tag with Memento Tuxedo Black ink with an InkBlusher. 7. Stamp Rubber Moon Reindeer and sentiment on white cardstock with Tuxedo Black ink. Outline reindeer with Memento Summer Sky Marker. 8. Adhere sentiment, and reindeer to tag and add snowflakes and embellishments. This entry was posted in Cards, Darsie Bruno, Taylor Usry. Bookmark the permalink. Both of these are gorgeous! LOVE the chalkboard tag! What a beautiful gift tag! Would be thrilled if this WAS the gift! Also Love the Think Big card !That technique is just begging me to play!